Black Widow and Hawkeye are joining nearly a dozen familiar faces from the Marvel Universe. Get ready for the largest gathering of Marvel Super Heroes at sea. 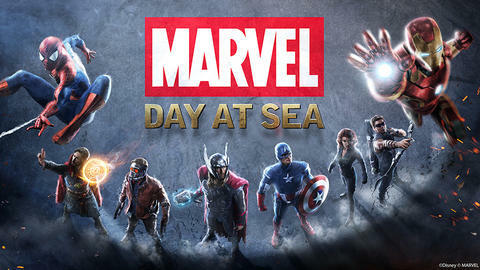 Marvel Day at Sea features exclusive character interactions where you’ll have a chance to meet astounding Super Heroes and a very extraordinary Villain. It was revealed today that Black Widow and Hawkeye will also join this epic event. They are assembling with nearly a dozen others from the Marvel Universe, including Black Panther and Loki, who will make their very first appearance as part of a Disney vacation experience. The event also marks the first official appearance of Iron Man, Star-Lord, Gamora and Groot on a Disney Cruise Line ship. Rounding out the roster of Marvel Super Heroes that will be onboard are Spider-Man, Captain America, Thor and Doctor Strange. Throughout this day long celebration, you will have the opportunity to see some of these legendary characters from the Marvel Universe up close and in person…. Just some of your own heroic encounters may include sharing a salute with Captain America, joining forces with Black Widow, taking a selfie with Star-Lord, getting up close with Groot, coming face-to-face with Thor or catching Loki lurking around the ship. Stay tuned for more exciting details about the Marvel Day at Sea voyages, including how to pre-book select Super Hero encounters during this special day at sea. The event premieres on select 7- and 8-night Bahamian and Canada cruises from New York this fall, and returns on select 5-night Western Caribbean cruises from Miami in early 2018.